Andy Peaks has urged his AFC Rushden & Diamonds players to not waste the hard work they put into this season so far. 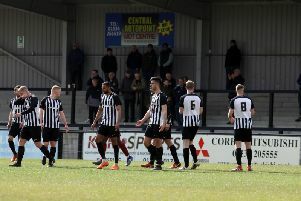 With 11 games to go, Diamonds have given themselves a huge chance of claiming a play-off place in their debut campaign in the Evo-Stik League South Premier Division Central. It really has been a season to savour after Peaks guided his team to promotion from Step 4 last April. And Diamonds have stepped things up over the past few weeks. Last weekend’s 1-0 victory at Halesowen Town, courtesy of a second-half header from Ben Diamond, made it eight games without defeat while Diamonds have suffered just one loss in the last 16 league matches. Their latest success moved them back into the top five but they face another huge test at Hayden Road tomorrow (Saturday) when Alvechurch, who are one point and one place behind them in the tight race for the play-off places, are the visitors. Peaks believes his team have been the surprise package of the season. And, having come this far, he doesn’t want to see them waste the opportunity that now lies in front of them. “I set down the challenge to the players around three weeks ago,” the Diamonds boss said. “I wanted them to see just how well they had done up until that point but then I asked them whether they were just happy with that or whether they wanted to step it up another level and ask a few questions of those around us in the league table. “I think they have answered that challenge extremely well and have shown exactly what they want to try to achieve this season. “And they know that if they step off it slightly, then we will come unstuck. “We are on a great run and the more good performances and results we produce over the next few games, the closer we will be. “I think we have surprised a lot of people with just how well we have done.